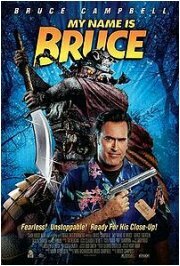 Movie: "My Name is Bruce"
Plot: Bruce Campbell is abducted by a young fan and taken to the town of Gold Lick, Oregon. The townsfolk believe that he is the only one who can save them from Guan Di, an ancient spirit sent to avenge the deaths of several Chinese laborers who lost their lives in a mining accident decades ago. Campbell, meanwhile, thinks it's a big ruse until Guan Di shows up and starts chopping off heads. Will he man up and help save the town? Review: Bruce Campbell has been in a lot of bad movies, and he’s not ashamed to admit it. A man has to eat, after all. But what if there was a whole movie built around this notion? That’s more or less what you have with My Name is Bruce. Bruce Campbell plays himself (kind of), and the very first scene with him in it is him acting in a fake movie that you wouldn’t be surprised to see on the Sci Fi Channel. Once his scene is over, he starts dishing out the corny one-liners like there’s no tomorrow, first trying his best to pick up the female lead, and later taking his obnoxious fans down a peg. I like Bruce Campbell. He’s got a funny niche carved out for himself, and he makes it work. When I heard about a movie where he plays himself trying to bring his demented fans in line before they’re all killed by a real monster, it seemed like a sure thing to me. I’ll say this: I liked Bruce Campbell in this movie, but the movie itself... eh. Part of the problem is the film’s focus on bad movies, particularly those that star Bruce Campbell. The film pokes fun at bad movie cliches, and Campbell himself even remarks that Guan Di attacking Gold Lick sounds like the plot of a bad movie. The film commits many of these same cliches with a wink to the audience to let them know it’s all a joke. In the end, though, it all winds up being really tiresome. By himself, Campbell does have a few funny moments. When he has to interact with any of the other actors, the humor quickly devolves into really lame jokes, and pratfalls punctuated with cartoon sound effects. When Campbell is alone, he puts on a one-man show with ranting monologues and such, and it’s funny because he’s acting like Bruce Campbell, and odds are, you’re watching this movie because you’re a Bruce Campbell fan. Not long into the film, however, you’ll wish you were just watching him. One of the worst examples of this comes from Ted Raimi. Raimi plays three different roles in the film, each worse than the one before it. First, he plays Campbell’s seedy agent, and he does alright. Later, he reappears sporting a fake mustache and a bad French accent as the guy who changes the population sign for Gold Lick as people are killed. Later still, he puts on a Fu Manchu moustache, stains his teeth, and unleashes an atrociously bad Chinese accent as Wing, the only surviving relative of one of the laborers buried in the mine. Though meant to serve as some kind of amusing slur, the two sequences with Raimi as Wing are just plain painful to watch. I really wanted to like this movie, but it’s a horror/comedy that’s pretty lame on both fronts. It pokes fun at bad movies, yet in doing so, it winds up being just as bad. And not in a good way. They say there’s already a sequel in the works. Hopefully, it will be either a lot funnier, or a lot scarier. I just finished listening to a podcast from a movie review show out of D.C. (http://www.wjfk.com/pages/1425489.php). It was from November 16 when the movie was playing in theaters. It was really enjoyable to hear his thoughts on the whole thing but on the other hand it is biased. It's only about 20 minutes and worth checking out. I'm glad Dr Boogie reviewed this though because I have a feeling I will be less disappointed after I watch it. Let's be honest with ourselves, if it has Bruce Campbell we're probably going to watch it. I went to the showing where Bruce Campbell himself made an appearance. He helped prank-call an audience member's mother, claiming to be a kidnapper. You're right, Bruce on his own is hilarious, and as much as I wanted to like the movie it was unfortunately a let-down. I think the problem with Campbell's recent films is that he's somehow fallen in D grade movies and he's a B (or imho A) grade actor. That explains why in your review you found the scenes with just him in it much better than the rest of the film as he's the best actor by a mile and the film is too horrible for his cult status. Look at his bit part in spiderman 3, with actual actors in a real film and you can see the potential the man has, the problem is nobody wants to put him in a top-shelf film as the lead. Unfortuantely, as he is getting older we'll probably never see him in a quality level film like he deserves. I keep seeing this film get a lot of flak, and it's entirely understandable. A lot of points were named in the review that are pretty accurate (especially the Ted Raimi bits. I liked him as the agent, but it all just went downhill from there with him). But dammit all, I just really enjoyed this movie. I was laughing all the way through it, and still want to see it again. Don't really have any good reasons to defend my position with, I just liked it. Also, I watched this on the theater tour, so Bruce himself appeared for a little Q & A beforehand. Damn funny guy, thoughts on the movie notwithstanding. I was really hoping that this movie would be good. Still waiting on Evil Dead 4 as well. Everything relevant has been said; but it is my duty to add HAIL TO THE KING, BABY! I just watched this film. I am glad I did. It is okay. I doubt i would by it but worth the watch if you are renting. The movie was mediocre. But what ticks me off as fan of The Three Kingdoms, is that they call Guan Yu "Guan Di". The inexplicable chorus guys even taunt the viewer with their song lyrics: "Guan Di is his name." "Guan you, Guan me, Guan Di." It's very annoying. I like it. I like how it seems to take place in the same universe as his (Campbell's) book. I also like how he named his dog Sam'n'Rob. My favorite joke was when he gave his dog vodka and later drank the dog's booze.